In Japan the print has occupied a very important position as an art form. 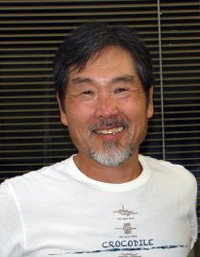 Over a long and distinguished career Katsunori Hamanishi has focused on the production of mezzotint prints, perhaps the most demanding of all print techniques. Hamanishi creates images with both subtle details and dynamic compositions that explore spatial relationships. His work is celebrated for balancing calm and meditative qualities with energetic tensions of inanimate and natural objects. There is a sense of mystery and intrigue in his prints. Hamanishi was born on Hokkaido, Japan’s second largest island. In 1973, he finished his studies at Tokai University in Kanagawa prefecture. His work has been exhibited internationally in Paris, Belgium, Philadelphia, Tokyo, Kyoto, Cairo and San Francisco as well as in the Ibiza International Print Biennial and the Valparaiso International Exhibition, Chile. In 2012 The Art of Darkness opened at the Arthur M. Sackler Gallery in Washington DC featuring Hamanishi’s mezzotints along with those of Yozo Hamaguchi (he created Papillon Rouge, Publication Print No. 51 from 1973). In 2013 Hamanishi had a one-man show at the Art Institute of Chicago. Under that grant, Hamanishi studied at the University of Pennsylvania. He, his wife Tsuyako and their two sons stayed in Philadelphia for a year while he studied art and produced new work. Hamanishi returned to the Cleveland Institute of Art in 1998 and again in 2014 to conduct mezzotint demonstrations. Hamanishi is at home with both Japanese and western art history although many of his subjects are borrowed from the Japanese tradition. His favorite themes are objects that can be shown three-dimensionally like ropes, plants and the twigs of a tree. It may be that he chooses the most difficult objects to demonstrate his skillful draftsmanship and mastery of mezzotint. In recent years Hamanishi has begun to add a bright touch of red or green as a contrapuntal note to detailed compositions, and these sudden bursts of color emphasize even more the dazzling brilliance of his creative imagery. Mezzotints are known for a dark and atmospheric appearance. The first step in producing a mezzotint is to roughen the surface of the copper plate which produces a solid black shape when printed. Then burnishers and scrapers are used to remove the texture on the plate to create a wide variety of tones and highlights. The process is difficult and laborious but the results have a special velvety appearance. In order to produce this print titled White Head Eagle (the translation of bald eagle), I considered that I am an artist who lives in Japan and The Cleveland Print Club is an organization in the United States. I decided to express the relationship between the two cultures in my style, using the Japanese costume, kimono, as a canvas. 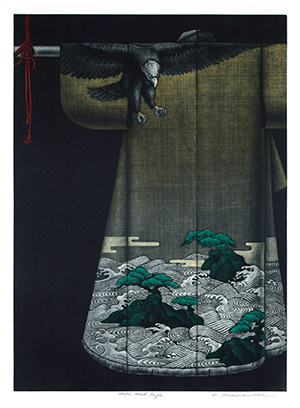 I placed the symbol of America, a white headed eagle at the collar of the kimono. And then at the hem, I depicted the ocean with big waves in which I tried to express today’s world. Since ancient times in Japan tagasode, the gorgeous women’s kimonos that were hanging on a kimono rack, have often appeared on screens. This time, I decided to use the traditional Japanese composition with tagasode. I hope all the members of the Cleveland Print Club will enjoy this print. WHITE HEAD EAGLE. The Print Club of Cleveland Publication No. 94, 2016. Color mezzotint on Muse Mat Thunders paper. Printed in 2014 by the artist in Japan. "It has been wonderful to have warm friendships with many people in Cleveland."